The perfect coffee begins with freshly ground beans. 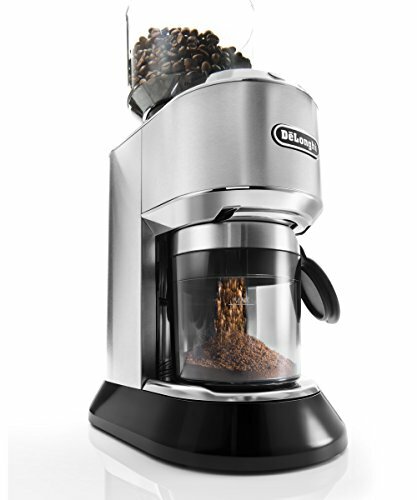 The De'Longhi Dedicate Grinder, model KG 520.M features 18 variable coffee and three strength settings for Espresso, Drip Coffee/ Pour Over and French Press, so you can easily customize your perfect brew. The slim, modern design complements the Dedicate Pump Espresso Machine range, creating the ultimate at home espresso experience. You can choose to grind large quantities in advance and store your fresh grinds in the 14 cup included storage container, or simply grind per cup directly into the porta filter. The Dedicate professional style grinder features a user-friendly LCD control panel, allowing you to choose the grind setting, number of cups, and aroma preference at the touch of a button - it's so easy. Additionally, the removable upper burrs makes it not only simple to use, but easy to clean. Enjoy the quality of a coffeehouse brew right in the comfort of your own home with freshly ground beans.